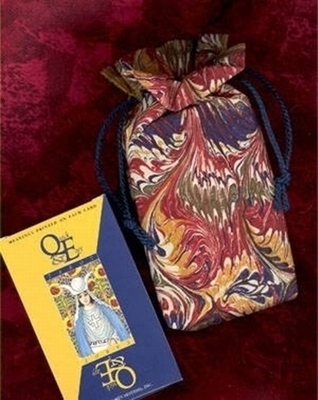 Double Draw Tarot Bags - Mage Path Double Draw Tarot Bag - Tarot Bags, Tarot Cards, Cloths, & More! Like the often convoluted path of one seeking occult knowledge or "enlightenment," the design is both puzzling and beautiful. Size: The Regency-style ruffled tarot bag is 7-1/2 x 5 x 1 inches. It fits most standard sized tarot decks that are up to 3-1/4 x 5-1/2 inches. There is an one-inch ruffle on top and an one-inch gusset (tote style) at the bottom. It is made of cotton and closes with two drawcords made from 34 inches of twisted rope decorator cord. The tips of the navy blue cords form small tassels. Picture: The Mystic Path double-draw bag is shown in the picture with a deck that we think is a great match, the Quick & Easy Tarot. The deck in NOT included.